The 6th Marine Division was a United States Marine Corps World War II infantry division formed in September 1944. During the invasion of Okinawa it saw combat at Yae-Take and Sugar Loaf Hill and was awarded a Presidential Unit Citation. The 6th Division had also prepared for the invasion of Japan before the war ended. After the war it served in Tsingtao, China where the division was disbanded on April 1, 1946, being the only Marine division to be formed and disbanded overseas and never set foot in the United States. The 6th Marine Division was activated on Guadalcanal in the southern Solomon Islands on September 7, 1944. The 6th Division was formed from three infantry regiments, the 4th, 22nd and 29th Marines, and other units such as engineer, medical, pioneer, motor transport, tank, headquarters, and service battalions. The core cadre around which the division was formed was the former 1st Provisional Marine Brigade, which included the 4th and 22nd Marine Regiments, plus their supporting artillery battalions; these artillery battalions were later consolidated into the 15th Marine Regiment. The Battle of Guam ended in August 1944 and the 1st Provisional Marine Brigade was called to Guadalcanal along with the 1st Battalion, 29th Marines, which had served with the 2nd Marine Division in the Battle of Saipan on the Mariana Islands. With a core of all these veterans incorporated into the new division, the 6th was not considered "green" despite being a new formation; most of the men were veterans of at least one campaign and many were serving a second combat tour, half the forces in the three Infantry Regiments were all veterans, and some units even consisted of 70% veterans. The 2nd and 3rd Battalions, 29th Marines, disembarked from the United States on 1 August 1944, and landed on Guadalcanal on 7 September 1944 to further augment the division. The now fully manned 6th Division underwent "rugged" training on Guadalcanal between October and January before it shipped 6,000 miles to land as part of the III Amphibious Corps on Okinawa on 1 April 1945. The 6th Marine Division wade ashore to support the beachhead on Okinawa, 1 April 1945. Initial plan of the assault showing the 6th Marine Division's role. The division's initial objectives in the amphibious landing were the capture of Yontan Airfield and protection of the left (north) flank. Despite a Japanese battalion in their zone the division met only light resistance. By the third day, the division was approaching Iskhikawa, twelve days ahead of schedule. By 14 April, the division had swept all through the northern Ishikawa Isthmus, 55 miles from the original landings. The division's rapid advance continued until eventually they encountered prepared and dug-in defenders at Yae-Take, where the majority of the Udo Force was entrenched. The Udo Force, or Kunigami Detachment, under Colonel Takehiko Udo was built around the 2nd Infantry Unit of the 44th Independent Mixed Brigade—reinforced by having absorbed both former sea-raiding suicide squadrons and remnants of the Battalion earlier destroyed by the 6th—was responsible for defense of the Motobu Peninsula and Ie Shima. The 6th Division's drive captured most of northern Okinawa and the Division won praise for its fast campaign – Brigadier General Oliver P. Smith wrote: "The campaign in the north should dispel the belief held by some that Marines are beach-bound and are not capable of rapid movement." After heavy fighting in the south, the division was ordered to replace the Army 27th Infantry Division on the western flank. The 6th division advanced south to partake in the assault against the strong Japanese defense line, called the Shuri Line, that had been constructed across the southern coastline. The Shuri Line was located in hills that were honeycombed with caves and passages, and the Marines had to traverse the hills to cross the line. The division was ordered to capture the Sugar Loaf Hill Complex, 3 hills which formed the western anchor of the Shuri Line defense. The Marines that had assaulted the line were attacked by heavy Japanese mortar and artillery fire, which made it more difficult to secure the line. After a week of fighting, the hill had been taken. A patrol of Marines from the 6th Marine Division searches the ruins of Naha, Okinawa in April 1945. After Sugarloaf the Division advanced through Naha, conducted a shore-to-shore amphibious assault on, and subsequent 10-day battle to capture, the Oroku peninsula (defended by Admiral Ōta's forces), and partook in mop-up operations in the south. The battle on Okinawa ended on 21 June 1945. 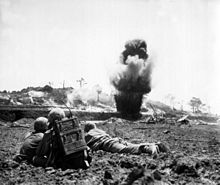 The Sixth division was credited with over 23,839 enemy soldiers killed or captured, and with helping to capture ​2⁄3 of the island, but at the cost of heavy casualties, including 576 casualties on one day (May 16) alone, – a day described as the "bitterest" fighting of the Okinawa campaign where "the regiments had attacked with all the effort at their command and had been unsuccessful". For extraordinary heroism in action against enemy Japanese forces during the assault and capture of Okinawa, April 1 to June 21, 1945. 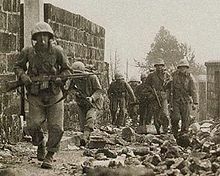 Seizing Yontan Airfield in its initial operation, the SIXTH Marine Division, Reinforced, smashed through organized resistance to capture Ishikawa Isthmus, the town of Nago and heavily fortified Motobu Peninsula in 13 days. Later committed to the southern front, units of the Division withstood overwhelming artillery and mortar barrages, repulsed furious counterattacks and staunchly pushed over the rocky terrain to reduce almost impregnable defenses and capture Sugar Loaf Hill. Turning southeast, they took the capital city of Naha and executed surprise shore-to-shore landings on Oroku Peninsula, securing the area with its prized Naha Airfield and Harbor after nine days of fierce fighting. Reentering the lines in the south, SIXTH Division Marines sought out enemy forces entrenched in a series of rocky ridges extending to the southern tip of the island, advancing relentlessly and rendering decisive support until the last remnants of enemy opposition were exterminated and the island secured. 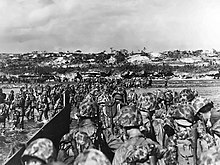 By their valor and tenacity, the officers and men of the SIXTH Marine Division, Reinforced contributed materially to the conquest of Okinawa, and their gallantry in overcoming a fanatic enemy in the face of extraordinary danger and difficulty adds new luster to Marine Corps history, and to the traditions of the United States Naval Service. In July 1945, the 6th division was withdrawn from Okinawa to the island of Guam to prepare for Operation Coronet, the planned invasion of Honshū, Japan that was supposed to occur in April 1946 but the Japanese surrendered in August 1945. While the 4th Marines were sent for brief occupation duty in Japan, the rest of the 6th spent September in Guam preparing for duty in China. The division arrived in Tsingtao, China on 11 October 1945 where it remained until it was disbanded on April 1, 1946, being replaced by the 3d Marine Brigade. In its time at Tsingtao the division not only accepted the surrender of local Japanese forces (on October 25) but also oversaw their subsequent repatriation to Japan; prevented the communists from attacking the surrendered Japanese forces and dissuaded communist forces from advancing on the city, restored and maintained order, and came to be seen as the protector of minority groups in the former German concession. ^ Carlton (1946), p. 1 & Rottman (2002) p. 140. Carlton, Philips D. (1946). The conquest of Okinawa: an account of the Sixth Marine Division. Washington, D.C.: Historical Division, Headquarters, U.S. Marine Corps. Hallis, James (1 Sep 2007). Killing Ground on Okinawa: The Battle for Sugar Loaf Hill. Naval Institute Press. ISBN 9781591143567. Nofi, Albert (1997). The Marine Corps Book of Lists (Illustrated ed.). Da Capo Press. p. 79. ISBN 9780938289890. Rottman, Gordon L. (2002). U.S. Marine Corps World War II Order of Battle: Ground and Air Units in the Pacific War. Westport, Connecticut: Greenwood Press. ISBN 0-313-31906-5. Shaw, Jr., Henry I (1968) . The United States Marines in North China 1945–1949 (PDF). Marine Corps Historical Reference Pamphlet (Revised 1962 ed.). Washington D.C.: Historical Branch, G-3 Division, Headquarters, U.S. Marine Corps. Sloan, Bill (14 Oct 2008). The Ultimate Battle: Okinawa 1945—The Last Epic Struggle of World War II. Simon and Schuster. ISBN 9780743292474. Stockman, James R. Sixth Marine Division (PDF). Historical Division, Headquarters, U.S. Marine Corps. Archived from the original on 2014-01-16. Retrieved 5 July 2013. Johnmeyer, Hillard E. "Okinawa: Sugar Loaf Hill". The Military and Wars. Something about everything military, From the Revolution to Nuclear Subs. Archived from the original on 27 September 2011. Retrieved 5 July 2013. Fisch Jr., Arnold G. Ryukyus. World War II Campaign Brochures. Washington D.C.: United States Army Center of Military History. ISBN 0-16-048032-9. CMH Pub 72-35. Huber, Thomas M. (May 1990). "Japan's Battle of Okinawa, April–June 1945". Leavenworth Papers. United States Army Command and General Staff College. Archived from the original on April 30, 2008. Retrieved July 11, 2014. Lacey, Laura Homan (2005). Stay off the Skyline: The Sixth Marine Division on Okinawa: An Oral History. Washington, DC: Potomac Books. ISBN 9781574889529. Nichols, Jr., Chas. S.; Shaw, Jr., Henry I. "Action in the North, Chp 6 of Okinawa: Victory in the Pacific". Historical Section, Division of Public Information, U.S. Marine Corps. Archived from the original on April 13, 2010. Retrieved July 11, 2014. Shilin, Alan T. (January 1945). "Occupation at Tsing Tao". Marine Corps Gazette. 29 (1). Wikimedia Commons has media related to 6th Marine Division (United States). "Battle of Okinawa: The Bloodiest Battle of the Pacific War". HistoryNet. Retrieved July 11, 2014. This page was last edited on 23 January 2019, at 11:21 (UTC).